The Copa is a standard turn pattern that was popular during the Disco Hustle dancing era of the late 70’s and early 80’s. At the time, the world famous Copacabana Night Club in New York city had two separate ballrooms. One would house the Hustle crowd, while the other the Salsa / Mambo crowd. During the course of the evening the Hustle dancers would take a break and sneak over to the Salsa room to dance a little Salsa for a while. They incorporated many of their figures and turn patterns from Hustle and combined them beautifully within the Salsa framework and dance steps. The step called “The Copa” seemed to fit most appropriately, and was accepted by the Salsa community in New York as a standard move within Salsa combinations. Hence the reason why they call this particular step, “The Copa”. Considered by many to be one of the world’s best leads, Mimo explains in detail each Copa move explicitly. 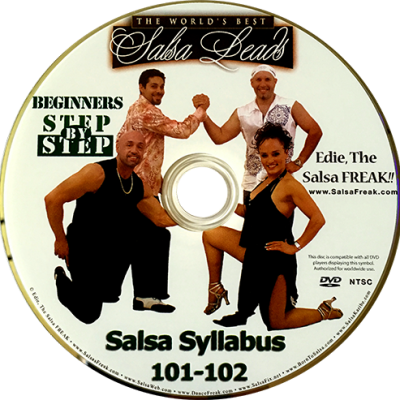 In this DVD, Mimo and Edie demonstrate a multitude of different variations of the Copa step, applied to Salsa. Once you understand the basic principals of the Copa, you can add your own variations as well. This DVD is a MUST HAVE for the Intermediate to Advanced Salsa and Hustle dancer.